Efficient management system and scientific production system, achievements of today's chinese. Step into the Chinese and explore the future from history. CM voted as “China’s general supplies ten most potential enterprises” and “China’s general supplies” ten well-known enterprises for two consecutive years. CM was selected as the “governing unit” by the Second Council of Zhuhai consumables industry association”. 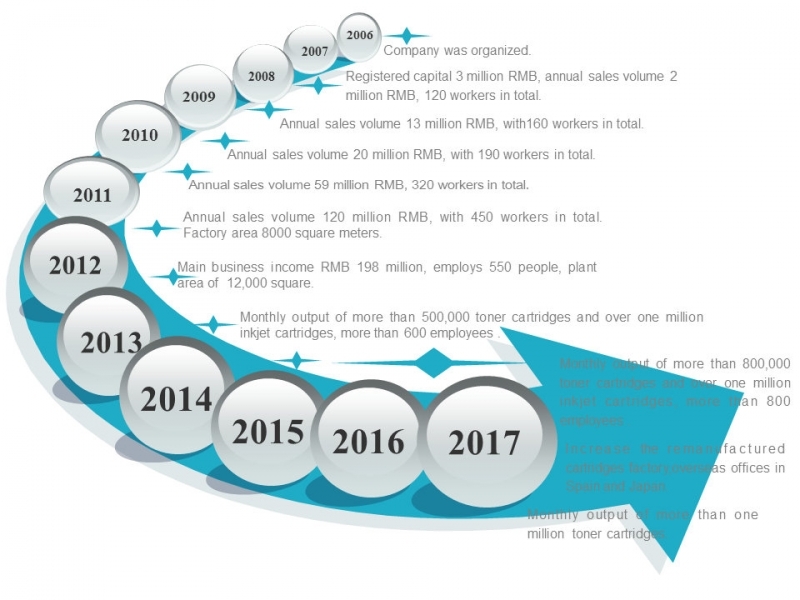 CM month output exceeded 200 thousand cartridges, 1 million cartridges, into the national printer compatible consumables and recycled supplies industry top ten. CM was awarded the “A” class credit qualification certificate issued by CITIC insurance. CM won the silver medal of the second environmental protection innovation design competition. CM month output exceeded 500 thousand cartridges, into the national printer compatible consumables and recycled consumables industry top five. Focus on the major business; many businesses develop simultaneously, subject to diversification. Focus on the independent innovation to speed up the progress of science and technology, open up new areas of high technology and potential market, and make new growth point in economic development. Focus on promoting the enterprise strategic management, strengthening the enterprise strategic management and executive ability to enhance staff centripetal force. Focus on improving the quality and efficiency of economic growth. Maximize the optimization of employee treatment, optimize the working environment and build the company into a faithful, innovative, harmonious, and progressive workers’home.